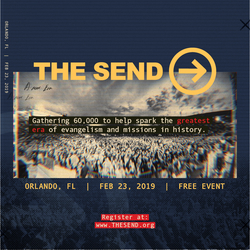 ORLANDO, Fla., Jan. 17, 2019 /Christian Newswire/ -- The Send is an epic, day-long stadium event that will draw more than 60,000 people to Camping Stadium in Orlando, FL on February 23, 2019. The heart behind this tipping-point gathering is to help spark the greatest era of evangelism and missions in history. Now is the time to catalyze action – to inspire everyday Christ-followers to share the Gospel in their everyday lives. If every believer in America lead just one person to Jesus this year, the Church would grow by more than 100-million people. An unbelievable line-up of speakers and worship teams will help impart this fresh passion for evangelism. Featured speakers include, Christ for all Nation's (CfaN's) Lead Evangelist Daniel Kolenda, as well as Lou Engle, Andy Byrd, Michael Koulianos, Brian Brent, Todd White, Heidi Baker, Francis Chan, , Bill Johnson, Loren Cunningham, Mike Bickle, Claudio Freidzon, Teo Hayahsi, Marco Barrientos and many, many more. Hillsong Young & Free, Jeremy Riddle, Jesus Culture, Tasha Cobbs, Lindy and the Circuit Riders, Stephanie Gretzinger, Darwin Hobbs, Matt Gilman, and Dunamis Music will lead the crowd in praise and worship. No doubt, the audience will be inspired to act, empowered to witness, and motivated to change their communities one soul at a time. It's going to be historic. Evangelist Kolenda is one of the key leaders of The Send. As such, Christ for all Nations has been central to the event's organization. The ministry is headquartered in Orlando and the team is thrilled to inspire a fresh move of evangelism in its own "neighborhood" even as it reaches hundreds of thousands in its Gospel Outreach Campaigns across Africa and beyond. Evangelist Kolenda said, "It's a fantastic chance to collaborate with other Christ-centered ministries. We all share a passion for Jesus and want Him to receive the full reward of His work on the cross. We're all in this together – to do whatever it takes to see the harvest come in." In light of that commitment, CfaN will host a table in the (FIND MY MISSION) area, where anyone can learn how to connect with the ministry, serve overseas, and take part in this Spirit-lead movement.